Did you make any resolutions this year? Was one of them to get healthy? My husband and I made the resolution to take control of our health last year and we’ve been going strong – making smart food choices, staying active, and setting a good example for our two young sons about staying healthy. My big part in keeping us healthy are the choices I make at the grocery store. We do a lot of fresh vegetables, fruits and lean meats. Of course we also snack and eat ready-made food as well – and I always have my eye out for new and interesting healthy products that I think my family would enjoy. One brand that I’m loyal to, and that I trust has my family’s health in mind, is Van’s Natural Foods, and I was thrilled to be able to review some new goodies that they’ve just brought to the market to help keep our healthy ball rolling! * Mighty Good BBQ! – these gluten free multigrain chips are filled with the goodness of brown rice, oats, millet, quinoa and amaranth. They have a great tangy flavor that’s sure to please any pallet – and at only 130 calories per serving, you can snack on these without the guilt! These chips are made without any artificial flavors or preservatives, no high fructose corn syrup, no hydrogenated oils or GMO oils of any kind. I am a big BBQ flavor fan and I think these are absolutely fantastic. They have a nice texture and crunch, and just the right amount BBQ flavor. They are my new favorite chip. They have an MSRP of $3.49. * Nacho, Nacho, Man! – these chips are made with the same goodness as the BBQ chips, but they feature a nice cheesy flavor that’s highly addicting. Another great snacking choice. I like these as my nighttime snack as I’m winding down my day. These also have an MSRP of $3.49. 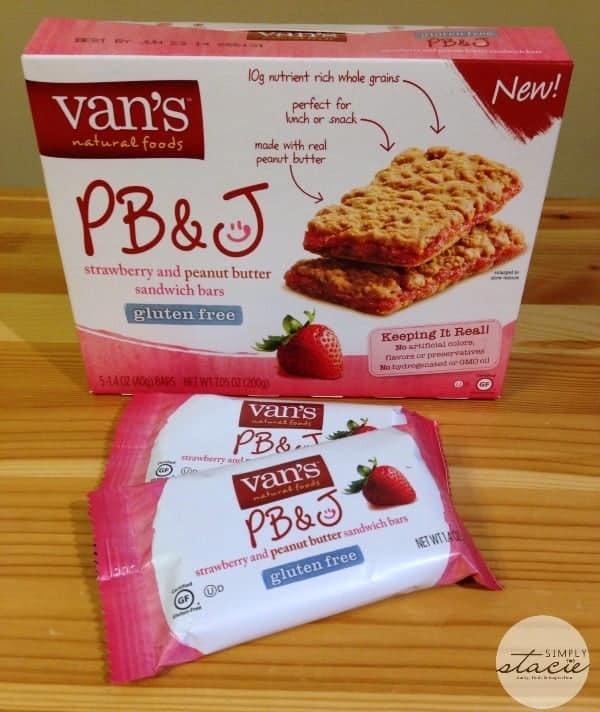 * PB&J Sandwich Bars – we received two flavors of these from Van’s, strawberry and blueberry. These are a great size for a mid-morning snack at work, or to throw into your kid’s lunchboxes. These bars feature a blend of real peanut butter and natural fruit filling sandwiched between two gluten-free whole grain bars. My kids like these bars, and my husband and I do too. They make for a nice treat after dinner, or as a quick on-the-go breakfast. Each 5-pack of bars has an MSRP of $4.49. Van’s also sent me coupons to pick up some products at my local store. I chose their gluten-free blueberry waffles, their latest cereal offering of Honey Nut Crunch, and another new snack food, Peanut Butter Chocolate bars. All of them taste wonderful. That’s what’s so great about the Van’s brand – they care about what they put in (and what they leave out) of their products, and they care about the quality and taste as well. I haven’t had one thing from Van’s that I haven’t absolutely loved. I’m especially digging the Peanut Butter Chocolate bars (if you’re a chocolate lover, these are for you!). If you’re a waffle fan, you really can’t go wrong with any of the Van’s offerings. They’ve even added a new one to their mix – a fiber- and whole-grain-rich, non-GMO waffle called Love Your Heart Waffles. These feature one gram of heart soluble fiber and 34 grams of whole grains. 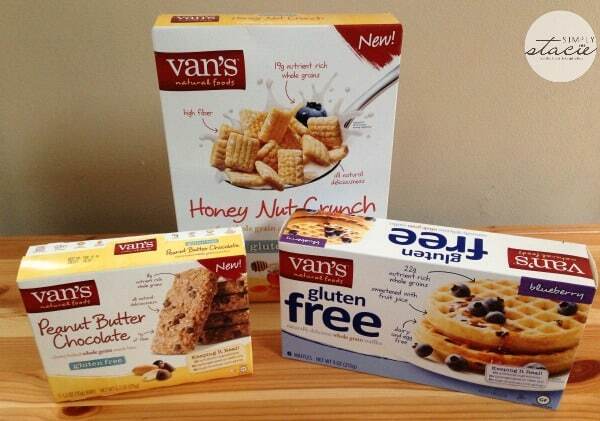 Van’s is a company that has been committed to bringing healthy, tasty foods to the market for decades. They cook their products in small minimally processed batches with always-fresh ingredients. Their products are great for the whole family and can help you get on (and stay on!) a healthy track. 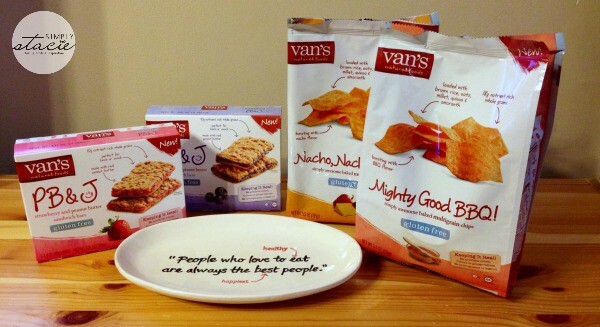 To see all the yummy stuff Van’s has to offer, visit their website. I’d like to try the Gluten Free Multigrain Chips Nacho, Nacho Man. I’d love to try the Gluten Free cranberry almond bars. I would like to try the Organic Waffles Blueberry. Gluten Free Snack Bars the Chocolate Chip variety sounds like something I would like. I am obsessed with Van’s waffles! I would love to try the Fire Roasted Gluten Free Veggie Crackers. Thanks for the giveaway!